Photo Frames and Poster Frames: Amazing Acrylic does it again! It’s amazing what the world of acrylic accomplishes these days.We, of course, are especially proud of our continuing innovations in the use of acrylic as a vehicle for displaying brochures, ad materials, promotional brochures, posters, photos, and other forms of advertising and information.By inventively developing a growing range of styles to accommodate a nearly infinite variety of print media, acrylic displays have a firm, long-lasting place in the service of industry and how businesses of all sorts represent themselves. You may not believe some of the creative uses of acrylic some rather ingenious folks have come up with. Familiar with the TV show Tanked on Animal Planet and what the staff at ATM (Acrylic Tank Manufacturing) can do – creating stunning acrylic aquariums out of items like juke boxes, old cars, safes, church pillars and walls, bunk beds, buses, and more? 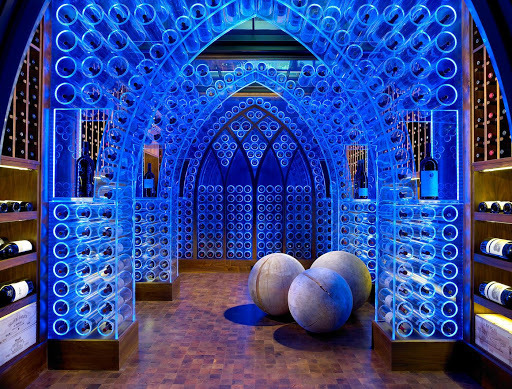 Or how about the climate controlled acrylic wine cellar Jamie Beckwith put in her Nashville, Tennessee home? 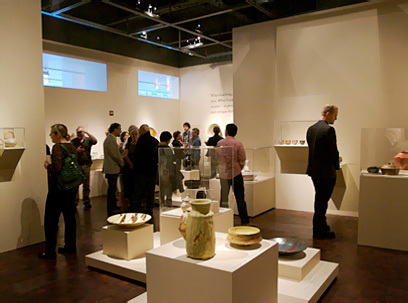 Featured on HGTV, the shapes, designs, and use of lighting in conjunction with acrylic design show just how unlimited and durable this formation of plastic can be…going as far as your imagination can take you. Obviously, the versatility of acrylic is incredibly diverse. And while our intent is not to sell you an out-of-this-world aquarium or million dollar wine cellar, we do feel truly inspired in our own ways…with acrylic photo frames and poster frames that will grab attention and deliver their own form of aesthetic appeal, inspiring your customers, prospects, and foot traffic in general. Here’s a way to get an edge with the use of color in a most solid looking photo frame. Our Green Edge Photo Frames are glass green in color and look exactly like glass, but in actuality are manufactured using the highest quality acrylic plastic on the market. With mounting hooks placed behind the frame, your signage gets a picture perfect view with the hardware hidden from sight. Another benefit of this dynamic photo frame is that it can be used either vertically or horizontally in sizes 4” x 6”, 5” x 7”, or 8-1/2” x 11”. When you see how this classy frame enhances your display, there’s no doubt everyone else will take notice, too. 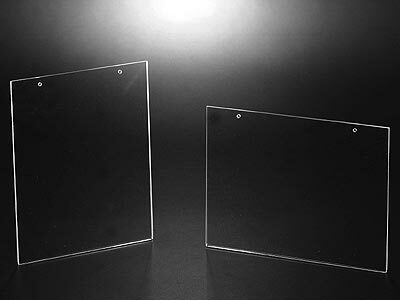 For a more traditional look, Black Border Photo Frameswith Clear Acrylic are a real eye-catcher. This particular style has the ability to add an attractive touch to all types of content because it lends an element of contrast. The acrylic clarity coupled with a one inch black border around the frame’s perimeter brings out the details of the content in the frame…increasing both the overall appeal in general and the focus on the photo, promotion, or design it contains. There’s a key hole on the back for easy hanging and black border photo frames come in three standard sizes. A real looker if we do say so ourselves! 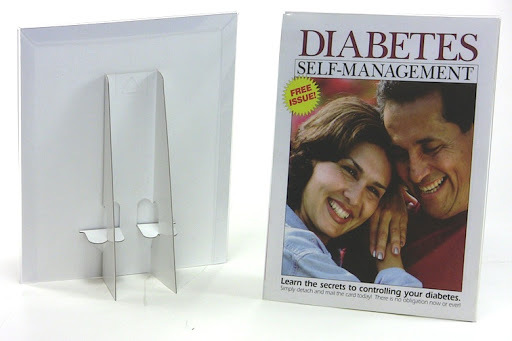 For those considering a special advertising campaign who would like to use the advantages of acrylic to their fullest while also looking for a more economical solution, Flush Top Photo Frames are the way to go. This affordable alternative provides the same visual benefits, like top visual acuity in crystal clear acrylic. Yet the beauty (or part of the beauty) of flush top frames is that they’re low cost enough that they can be purchased in higher volume. In this regard, you could advertise a certain promotion at multiple points of purchase for larger impact. For example, if you’re operating a larger retail store where foot traffic is widely dispersed, flush top photo frames give you the opportunity to spread the message and present those hottest sale items in more strategic areas simultaneously. It could also present greater opportunities when used in cross promotions with overhead audio advertising. Just a thought. Like wine cellars and aquariums, the uses for acrylic poster frames and photo frames are limited only by the imagination. For personal use or in commercial settings, the sky’s the limit! Versatile, flexible acrylic: is there anything it CAN’T do? Poster Displays in retail success, politics, and rock-n-roll! 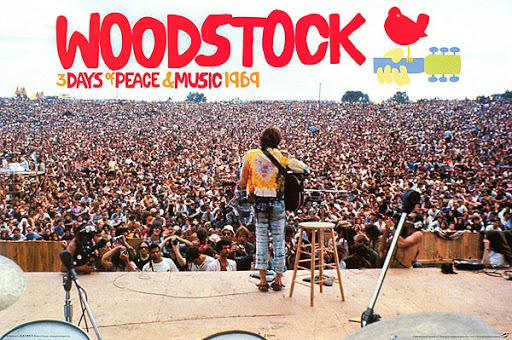 In the heyday of Woodstock, promotional posters for rock concerts became an art form of their own and are now collectibles.A poster promoting a 1966 Grateful Dead concert at the Avalon Ballroom in San Francisco can be yours for a mere $1500 if you play your cards right. From George Washington to The Who, the inventive use of posters has become part of Americana, carving a special niche in history, advertising, art, history, and politics. The simple fact of the matter, as you’d likely predict, is sheer cost-effectiveness.A 30-second TV spot, as Mascia points out, can run from $250,000 to $400,000.Ad clicks on the internet can run from 50 cents to $2 each per customer, and those can add up in a hurry.But with the initial cost of a poster running just $1 to $40, it will be viewed potentially hundreds if not thousands of times.Here, Mascia stresses placement of poster display…and this is our area of expertise. First, it’s all in the location, location, location. 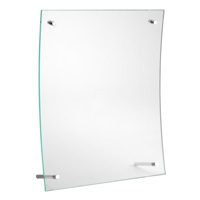 Wall Mount Poster Holders can really help turn merchandise into super sellers. Having a great range of both vertical and horizontal sizes offers all kinds of opportunities…not just dependent on the size of your poster but also on the physical space of your holder placement. 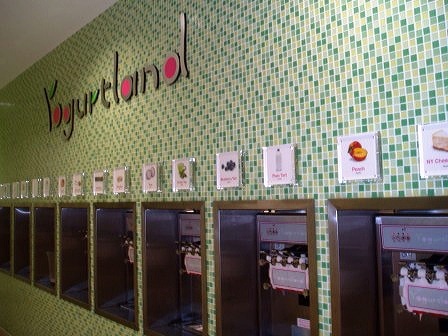 Vertically and horizontally, matching wall space with the most heavy foot traffic will get maximum impact from your poster holder and your merchandising promotions.These crystal clear plastic displays are also tough as nails, durable and impact resistant for a long life.A terrific value to be sure, and they mount to the wall easily with screws. There are other ways that have the world of poster holders looking up…literally!When wall space is at a premium or excessive shelving in a store layout has customer’s eyes a little more pre-occupied, promotional material can still be highlighted using Ceiling Mount Poster Holders. Who says posters have to be confined to the wall?Retailers are finding ceiling mountable poster displays a unique, effective form of promotion.You can really get creative with their usage, too, because sizes range from 11” wide x 14” high, up to 48” x 18” with many, many other combinations in between.Sales are definitely looking up, and they hang easily with S hooks. There’s one more type of poster holder to tell you about, an excellent choice especially if you have an entire suite of products to promote.Or to announce an event – a throwback to the old rock-n-roll concert days in a way.Regardless of the event however, Wall Mount Poster Displays are truly classy looking, adding a nice enhancement to your setting while building awareness at the same time.With mounting brackets that are hidden from view, this particular wall mount poster holder is available in so many sizes, you’ll be able to get outstanding results and make a really positive impact on a large audience.You’re giving customers mass appeal in a most affordable poster display with vertical sizes from 18” x 22” to 20” x 30” or horizontally from 24” x 18” to 48” x 18”…you can’t go wrong! One more important point James Mascia pointed out.“While TV and internet advertising can be geared toward your potential audience, there is no guarantee that the specific people you are trying to target will be the ones who will see it.”When you have quality poster displays in prime wall and ceiling positions showing your top promotions and events, you can target a more specific demographic and get immediate results.And the best part of it all?We can help you get it accomplished very economically…a great return on your investment!The Poster Display tradition is alive and well…very well! It’s a tough place, this competitive new global business arena. Besides the continual ebbs and flows of the economy and the effect they have on commerce, just trying to keep an edge on pricing and the COST of doing business poses huge challenges. Overhead, freight costs, payroll, facility management, marketing, distribution, permits, taxes, insurance…these business expenses mount in a hurry! No wonder it sometimes feels like the sharks are circling. Business owners, operators, and managers know this scenario all too well and are charged with the task of finding ways to operate in leaner fashion while still trying to turn a profit. Those who supply these decision makers and their operations must also have a keen eye on the marketplace and help contribute to something we call the Big Bang For Your Buck Theory. It’s simple, really.In a strong relationship between businesses and their suppliers, vendors find ways to help maximize what buyers get for each dollar spent.Those placing the order have already had to make tough decisions in those first-paragraph categories, and continuing to do business with forward thinking suppliers will be an easy decision if the vendor’s done their part to help keep costs low. Display stands, sign display holders, economy vinyl holders, and a number of other acrylic display options are among the formulas we’ve developed in support of the BBFYB Theory. Economy Clear Sign Holders are a great start.They slant back for easy readability, providing a crystal clear look at your top promotions.They’re adaptable to vertical and horizontal ad slicks, giving you dual functionality straight out of the box.And since this economy copy holder comes in five versatile sizes, you’re also presented with more streamlined options for brochure displays and hot promotion spotlights.Plus, the .070 thickness makes this economy sign holder a durable investment that ships well and lasts an incredibly long time.A scientific triumph that really takes a knock! Top-loading Economy Version Acrylic Display Stands also grab attention from both sides…an excellent low cost option, especially when you consider their value in high foot traffic areas.A double sided display stand in crystal clear acrylic has the potential to grab so many pairs of eyes, the payback could be scary in a really good way.Having your name or logo imprinted on the sloped base also adds to this display stand’s value, ensuring the association between you and the promotion du jour. Another element of the BBFYB Theory?It has to be double-sided Economy Sign Display Holders, known not just for their ability to stand out on countertops and desktops, but also for their tremendous economic capacities.Available in four standard sizes, carton weight and quantities make this stand-up display holder a true BBFYB value.Yet there’s no sacrificing visual acuity so the message you send still grabs the customers’ attention.The view from both sides? Excellent! We mentioned earlier that it takes forward thinking to develop solutions for customers with tough budgetary choices to make.That’s why we developed Clear Vinyl Sign Holders, attractively geared for countertop promotions and something you could use in a retail environment, trade shows, food-and-wine events…an array of opportunities.They’re ideally angled for a perfect reading slant, too.They travel well and come with a foldable stand, adding to their reliability and making Economy Vinyl Holders worth way more than their light weight.You can really take advantage of volume with vinyl sign holders in quantity pricing and shipping. If you’ve felt a little pressed budget-wise, don’t despair!There is help for your economy and we hope you’ve found our Big Bang For Your Buck Theory very enlightening.Put Economy Sign Holders to the test and see how successful your own experiments will be. Picture Frames: Get the Top 5 and the Picture, too! If a picture’s worth a thousand words, then that picture deserves a really nice frame, right?Do it proud… do it solid…and that picture could be worth TEN thousand words! But that’s just the beginning of the, er, framing picture.Sorry.There are a number of uses for the frames we’re going to detail here…for artistic types, galleries, and those wanting to display diplomas as well as product presentations by some of America’s most successful corporations!Whether for personal use or in professional capacities, here are a few excellent picture frame options for your consideration. Leading off, Thick Picture Frames. Now, if these were eyeglasses and this was the 3rd grade, you might lose your lunch money on the playground.But as a picture frame in commercial settings, this style is the boss…an ultra-slim profile with two super thick acrylic panels!This incredibly functional frame “floats” promotional material between those two panels and has become so popular that some pretty heavy corporate hitters are among our biggest customers.Major retailers like Gap and Gymboree use them as eye-grabbing Store Wide Discount Signs, and you may have seen them at the Yogurt shop, too.The folks at Apple really like the thick look and use our Thick Picture Frames as sign holders next to their i-Pads and i-Macs.And who can argue their choices of informational product displays?The innovators at Apple rang up $108 billion in sales in 2011 and as of September 2012, ranked as the largest publicly traded corporation in the world by market capitalization. But what holds those two acrylic frames together to create one so highly successful frame? 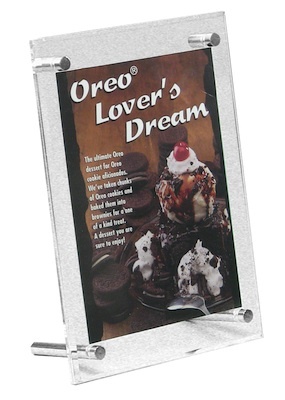 Magnets!These sturdy, functional frames come in three standards sizes and can be used anywhere – walls, counters, desktops.Thick Picture Frames can really boost a designated product’s profile! 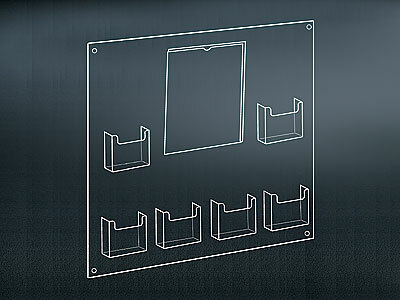 Acrylic Picture Frames are ideal for displaying special photos…on the desk in your office, on a retail countertop, or on the book shelf in your living room.This multi-functional display is a four-sided “open book” vertical picture holder.It comes in no less than a dozen standard sizes so it can be applied toward residential AND commercial use…business or pleasure.The acrylic really shows photos well and this frame is tough enough to last the long run. Picture Frames Display holders in a six-sided tri-fold?Here’s another popular display that applies well to both commercial and residential needs.Wedding or vacation photos?It’s a perfect portfolio.In the world of Home Décor, Picture Frames Display the multitude of decorating options that customers demand.When utilized as a vertical countertop display, this picture holder can lay out a number of color choices, for example, and then show how they’ll look in a model room.Durable and impact resistant, contents load easily from the top and can be updated easily with special pictures or promotions. Curved Picture Frames really show off the amazing versatility and flexibility of acrylic.If you want a picture frame to get noticed, here’s the one!It’s similar to Thick Picture Frames due to the fact that it’s actually two panels of acrylic joined by magnets.But what sets it apart is the beautiful curved shape, and you can choose whether you want the front to be convex or concave.Curved Picture Frames really look great in museums and galleries…very classy, modern, and elegant.That same touch also works well to enhance lobbies, showrooms, and photos in the home or office. The fifth frame is also curved with a clear face and black back.Black Border Picture Frames are concave displays like no other…so distinctive that they really draw a lot of attention.Operations supplying Schools and Universities have a great deal of success with this style because it makes such a superb showcase for certificates and diplomas.Small signs and promotions also become an instant draw thanks to the curved shape and nice contrast between clear and black.The acrylic panels in Black Border Picture Frames are also held together by magnets. So here you have five totally distinct picture frames…all versatile and multi-functional yet each with a niche all to itself.As always, the first thing to determine is what your audience wants to see – your customers, your guests – and where will THEY use them most?If the choices are too overwhelming, volume might be the way to go. But there’s no doubt about it: acrylic picture frames always find the perfect spot to show off! Sign Frames: Works of Art that really WORK! Like any priceless work of art, beauty is always in the eye of the beholder.But don’t underestimate the value of how that masterpiece is framed.Attention to detail is crucial, and overall presentation can make the difference between a crowd of onlookers and those who just walk by in oblivion. The same is true in the business world. Just like the Art Museum, the goal is to draw the eyes of your visitors to your framed masterpieces…like signs, promotions, important notices, pictures, advertisements, and the biggest highlights of the day, week, or month.Luckily, some pretty stellar options are available in the world of acrylics that can turn a retail sale or banking promotion into the next Rembrandt! When a sign frame takes the form of a curvy beauty, heads always turn. That’s what makes the sleek design of crystal clear sign frame holders such an obvious attraction…a convex curved vertical design on a very slightly tapered base that’s become a real draw in settings like hotel lobbies and furniture stores.This type of display gives a real touch of class in a very modern look. It’s something you want to look at automatically and the popular appeal goes hand-in-hand with its sleek appearance.Since these dazzling arched sign frames are available in 3-1/2” x 5”, 4” x 6”, and 5” x 7” sizes, the most frequently used placards and price displays are given top billing! A similar acrylic picture frame should also be mentioned here.Bowed sign framesdraw extraordinary attention with a concave curved design that’s almost an optical illusion!Geared specifically for material 8-1/2” x 11”, there’s no doubt the great masters of Art would have loved this clear plastic picture frame. Its decorative posts add to the eye appeal and functionally serve to keep the sign holder stable, sturdy, and upright on tables and counter tops.This bowed sign frame is truly stunning and especially preferred in banks, credit unions, and retail spaces where focus needs to be drawn on something special and outstanding.A true stand out classic to be sure!And in addition to its clear edges, there’s a green edged version of this elegant display that will turn practically any material into an instant masterpiece. When considering acrylic sign holders in your showcase, there are other options in addition to bowed and arched sign frames.Table signs offer extremely clear acuity and versatility.In fact, their use isn’t confined just to table top placement.This particular style is available to mount easily to walls, just like all great works of art.We can include the mounting accessories…there’s really nothing to it and table signs can be shipped very easily and cost-effectively.Like the bowed sign frame, table sign posts serve as a counter top base.Plus, it’s a style that can be used both vertically and horizontally to accommodate a myriad of advertisements.The options for acrylic table signs are endless! 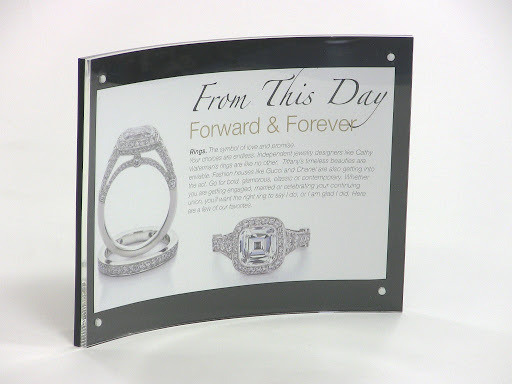 The easel style print holder also comes in a wide range of sizes with carefully polished edges for maximized eye appeal.This particular tabletop easel sign loads from the top and is sealed on the sides and at the bottom.From its acrylic base, the slightly slanted display invites the eyes to your latest promotions and if you’d like it customized with standard pockets, we can make that happen for just a little more. On display, every great work of art is beautifully framed.The aim is to help enhance and add to the appeal.Doesn’t that same principle apply at the point of purchase?When you stop to consider, there’s really only one conclusion…right? Sign Holders say it all: Full Green Ahead! Like telling stories? Not tall tales about the fish that got away, or ghost stories to scare the daylights out of your kids around a campfire. Instead, it’s the story about your business and all you have to offer. And best of all, you don’t even have to be a great story teller. With the right Sign Holder on prominent display, it’s your brochures, pamphlets, and advertising that do all the talking. For travel agencies and realtors, a glistening view of paradise or a stunning piece of property can lead your customers to ask how the story goes…and how to make that story a tale of their own. Retailers offering items from golf clubs, furniture to gas grills, new cars and holiday specials. Every picture tells a story. Creating brand awareness is part of the equation and is a common goal for both retail chains and independent store owners. The first challenge is driving business to your store in the first place. But once you’ve succeeded there, what awaits them when they walk through the door? Forward thinking cross promotion can include in-store advertising through audio and video, thanks to technology. According to E-Science News, 70% of shoppers make buying decisions while shopping, as opposed to pre-determined purchases before the shopping venture even begins. While companies like Wal-Mart, Macy’s, and Best Buy have installed video monitors and in-store “radio,” it’s equally important to have Sign Display Holders getting the word out. Not only does this reinforce brand awareness, it also encourages shoppers to take advantage of your strongest promotions. Paraphrasing University of Illinois business professor Yunchuan Liu, in-store advertising provides a persuasive plan when encouraging shoppers in a cash-strapped economy…beyond blanket manufacturer promotions. Now back to the story telling. What’s the best way to ensure customers see your top promotions? If overhead radio and video monitors aren’t in the advertising budget – and even if they are – acrylic display holders can really make a significant difference. 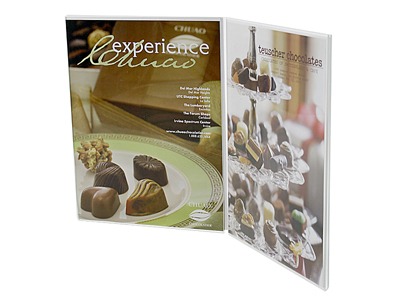 Crystal clear view ability with strategically placed brochure holders and POP display holders give customers immediate incentive to either buy or at least inquire. Why not help give impulse buyers the info or incentive they need to make informed decisions? Speaking of versatile, a top loading acrylic display stand with a brochure holder accounts for increased exposure and sales all by itself. An amazing looking sign that fits perfectly in a display 14” wide by 11” high, 11” x 8-1/2,” or 8-1/2” x 11” can be used for feature spotlights, and with a brochure holder incorporated into the display, customers are automatically encouraged to grab info “to go”…giving this display dual functionality and planting that seed right where you want it to grow. Remember that line in Field of Dreams…if you build it, they will come? Well, if you show it, they will grab…and act! If you don’t show your stuff with an effective countertop or wall display, they’ll never know, nor will you get to reap the benefits. Not good in today’s economy. Cross-promotion adds value in professional settings, too…like those agencies we mentioned earlier. In fact, acrylic displays take on even more importance since these settings are not as likely to be telling their stories via digital media. Want to plant a seed for that trip to Bermuda? Maybe a contest to win a new car or an I-pad? An acrylic display stand with a card holder will draw visitors and boost a competitive side of those wanting to improve their chances! 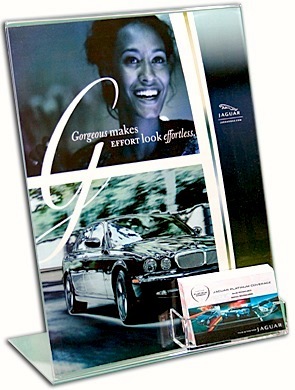 An acrylic sign holder with a business card holderalso gives life to your story and makes promotions pop. This display is slanted for easy reading from table or countertops. Sometimes, the impulse is not alwaysto buy immediately but providing business cards can lead to a bright future! Buyers like choices, and you can be sure that they’re doing their research. It’s also easy to offer multiple options with something like a wall mount sign holder WITH brochure holders, providing six different pockets 4” wide to put a number of promotions front and center with an added sign holder smack dab in the middle. Hang it in a prime wall position and let this eye catching display holder earn its keep! The versatility alone makes it a worthwhile investment. 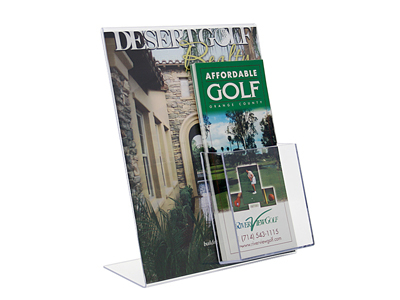 Sign holders with brochure holders also draw attention in all the right ways. Better yet, this particular style does double duty, showcasing promotional material from either side. With its convenient brochure holder attached to the front, there’s a magnetic pull. Not in the display itself but to prospects and customers. This one should be a definite consideration for double sided promotions. With the right acrylic display, your own story can become legendary. And how does the story end? Well, it doesn’t need one. Just make sure everyone’s paying attention…with all eyes on your newest chapter.